MSS Software has a wireless barcode scanner to meet the needs of users in virtually every scanning environment. Give us a call at 800-428-8643 for more information. CipherLab continues to provide flexibility and productivity with value with the 1500 series wireless scanners. This series includes the 1560 scanner, the 1562 scanner and the 1564 scanner. These lightweight wireless scanners are handy and easy to use, providing smarter devices to improve your business. With these scanners you can capture data from regular to long barcodes and with a choice of linear imager, 2D imager or laser. Datalogic Gryphon 2D Area Imager with Bluetooth. Comes with Adjustable stand/Base Station, Power Supply and US cord, USB cable and Manual. 1 Year Warranty and Black Color. (Note: These are re-manufactured but have never been used). The Xenon 1900g and 1902g are the best choices for optimized code-scanning. Being in line with the sixth-generation of area-imaging technology, the 1900g and 1902g offer versatility in barcode reading compatibility. These scanners can scan from high density linear images to 2D barcodes found on mobile devices. While the 1900g is wired, the 1902g is wireless with Bluetooth capabilities. The Granit 1911i is an industrial-grade area-imaging scanner that works wirelessly to scan all barcodes. This scanner features the same exceptional scan engine as the Xenon series of area-imaging scanners allowing for a top quality barcoding experience. Connects wirelessly with Bluetooth. This great new addition to our portable handheld scanner lineup is the Voyager 1602g. Modern and packed with features, this sleek new scanner boasts impressive specs while staying affordable. Bluetooth compatibility is included- the Voyager 1602g also works with both 1D and 2D images. 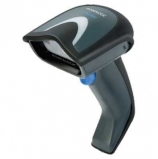 The unique white-LED light emitted from this scanner works effectively with even poor barcode images while staying efficient for point-of-sales, inventory, and customer engagement services. If you are looking for a 1D/2D scanner, two solid picks from the Voyager series are the 1450g (corded) and the 1452g (wireless) products. The main benefit of these scanners is in the cost-effective 1D to 2D upgrade plan (these scanners come available with 1D barcode scan engines and have the option to upgrade to 2D scan engines later). Upgrading is a swift process that requires only a simple software upgrade purchase. As with all products in the Voyager line, the unmatched performance allows for rapid and accurate scans for point-of-sales, inventory, and customer engagement services.